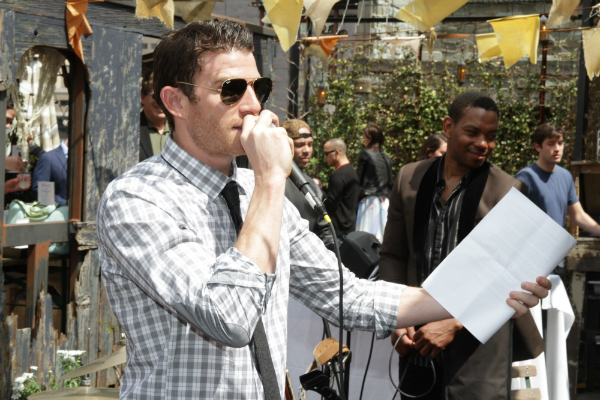 “The Olevolos Project” had the support of actor and philanthropist Bryan Greenberg for it’s 3rd annual charity brunch at Gallow Green of the McKittrick Hotel, home of Sleep No More. Bryan had the support Microsoft and friends and family including – fiance Jamie Chung, James Lafferty, Hill Harper, Eddie K Thomas, Josh Pais, Jessica Hart, Teresa Moore, Lily Lane, Wallis Day, Kira Dikhtyar, DJ Jus Ske, DJ Mel Debarge, and many more. They were there to support and raise funds for The Olevolos Project, a 501c3 organization that provides educational opportunities to disadvantaged young people in the Olevolos village of Tanzania. This was the third brunch Bryan has hosted for The Olevolos Project, an organization founded by his cousin Dory Gannes. After a trip Bryan took to Tanzania in 2010, he wanted to find a way to help. Funds raised from Saturday’s event will go straight towards The Olevolos Project’s Scholarship Program that supports the educational needs of disadvantaged and orphaned students of the Olevolos Village. With over 50 silent auction items including generous donations from The Stand Comedy Club & Restaurant, Guess, FlyWheel, Au Naturale and many more! A big thanks also goes to sponsors Brancott Estate Wines, Mumm, Corona, Red Bull, Don Julio, Tito’s Handmade Vodka. Host Committee members who support the event however were unable to join yesterday include; Justin Long, Hillarie Burton, Jamie Hector, Jeffrey Dean Morgan, Emmanuelle Chriqui, Julie Henderson, Gina Gerson, Geoff Stults and Victor Rasuk. At the event, Greenberg thanked everyone for showing their support. “I want to personally thank everyone who made it out to The Olevolos Project charity brunch on Saturday. It was our most successful brunch yet, we raised enough money to school 22 students for an entire year. Which includes all school fees, from private boarding, supplies, clothing, sleeping bags, along with medical expenses and various activities including a summer camp,” said Greenberg. In an interview after the event, Greenberg said this event is extremely important to him. You don’t have to attend the event to help out. Greenberg said anyone interested in finding out information or making a donation can visit the project’s website. The Wait is Finally Over – “Louie” Is Back!